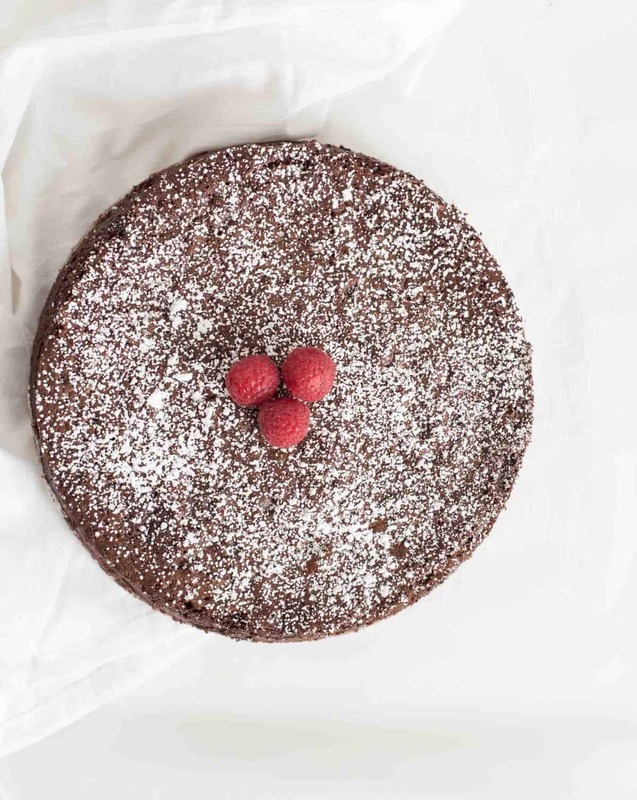 Light and fluffy flourless chocolate torte recipe made from just three simple ingredients. You won’t believe how delicious this flourless chocolate torte is. 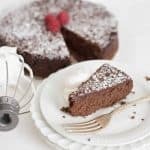 Flourless Chocolate Torte is one of those recipes that seems too simple to be true and when you are eating it, you think surely the recipe must be highly-involved. It just feels so decadent and fancy. I’m here to tell you that all you need is 3 ingredients, a spring-form pan, and a little bit of time, and you’ll have yourself one amazing dessert in the end. I have a thing for rich and chocolate desserts. I love chocolate lava cakes, flourless chocolate cake (that is a bit like a brownie), triple chocolate brownies, and classic chocolate chip cookies. 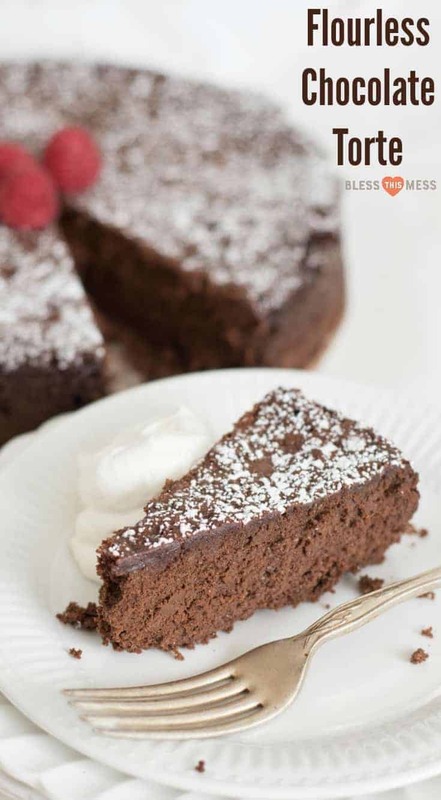 This flourless chocolate torte is such a fun and unique dessert though because of the texture. 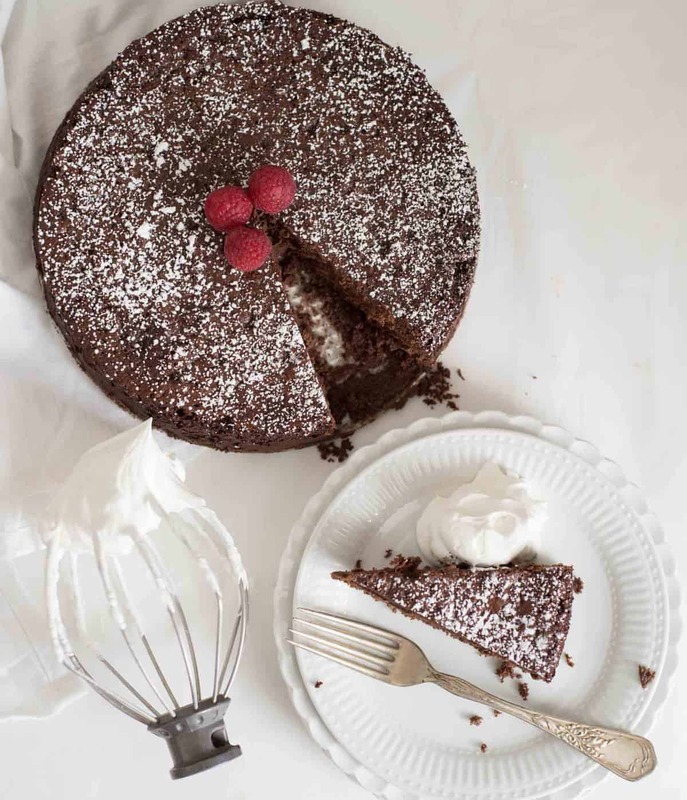 Normally flourless chocolate cakes are a bit like gooey brownies, but this flourless chocolate torte is made of whole eggs that are whipped and whipped and whipped, then baked up to a texture almost like a thick mousse. It’s very unique and so delicious. It’s not quite like anything I’ve ever made and I actually ended up making it about 6 times to makes sure I was doing it right and working out the kinks. I also had my mom make it (she’s at a much lower elevation than I am), to make sure that it worked for her, too. 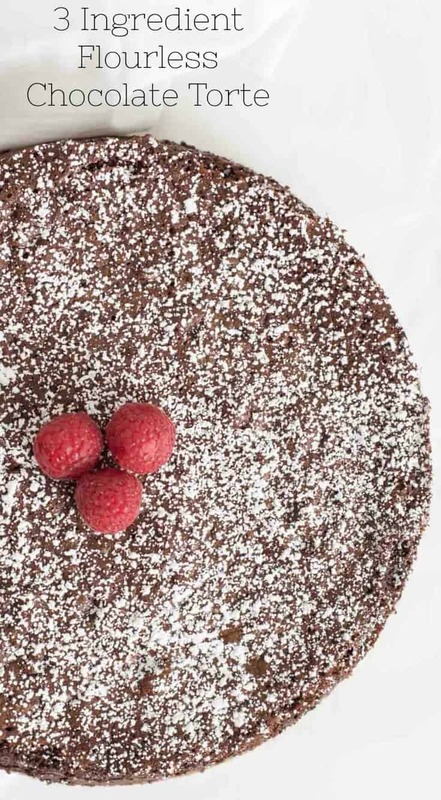 This rich but light and fluffy chocolate torte is naturally gluten free and made with only three ingredients – it’s got to be on your must-make list! The texture of this cake is very, very light, almost like a mousse or cheesecake. It’s amazing but different from what you are used to. I did not have luck using a smaller spring form pan; it didn’t set up right. The temperature of this cake is important to get that perfect texture. I recommend using a thermometer. This would be great in individual ramekins, cooking them until the temperature reaches 140 degrees. You’ll still want to cook it on a pan and add the water as if it were in a spring form pan. Lining the pan with a LARGE sheet of foil is a must before baking. I tried it once without it and the cake dripped out all over my clean oven. I tried it another time with two pieces of smaller foil and water seeped in and the bottom of the cake got wet. Do it right the first time and get wide foil for this. Because there are so few ingredients in this cake, use high quality ones. I love Guittard semi-sweet chocolate chips for this recipe. This dessert is super rich. A sweetened whipped cream or ice cream is a must for serving – don’t skip it. Run a large metal knife under hot water and then slice the cake. Clean and warm after each slice if you’d like nice clean pieces. 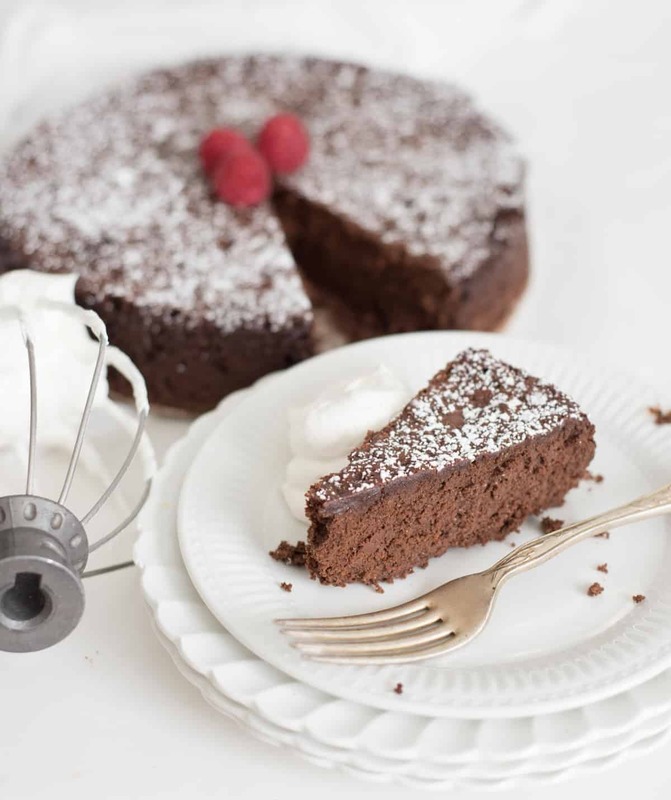 Light and fluffy chocolate torte made from just three simple ingredients. 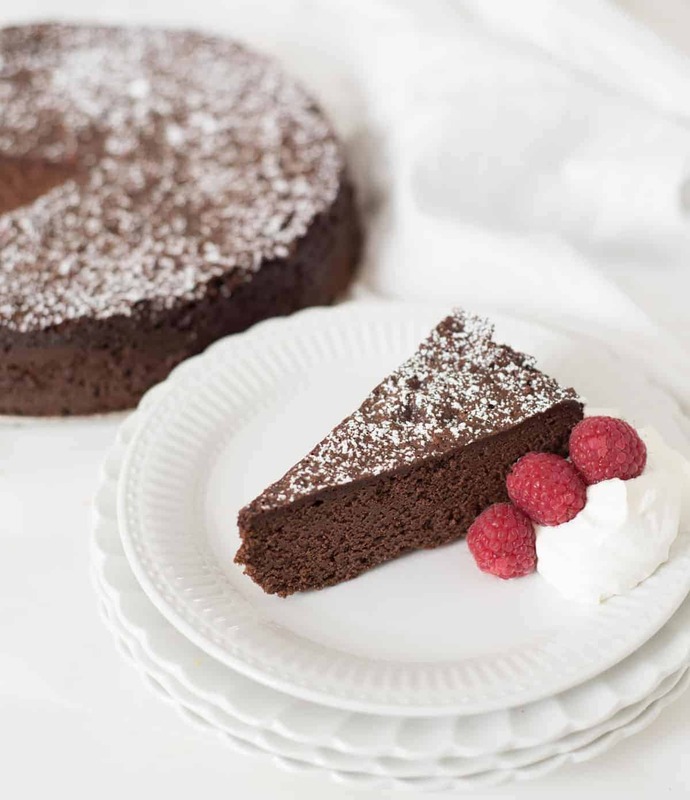 You won’t believe how delicious this flourless chocolate torte is! Adjust the oven rack to the lower-middle position and heat the oven to 325 degrees. Grease a 9-inch springform pan and then line the bottom with parchment paper. Wrap the outside of the pan with 2 sheets of wide heavy-duty foil and set the pan in a larger pan (like a roasting pan). Bring a kettle of water to boil. Mix the eggs in a large bowl with an electric mixer until foamy, about 1 minute. Beat on high until the eggs are very thick and pale yellow, 5 to 10 minutes. While the eggs are mixing, melt the chocolate and butter together in a microwave safe bowl, stirring often until the chocolate melts, 1-3 minutes. Transfer the mixture to a large mixing bowl. Let the mixture cool 1-3 minutes before adding the eggs. When the eggs are whipped, fold 1/3 of the egg mixture into the chocolate. Repeat twice more with the remaining whipped eggs and fold until the batter comes together and there are no streaks of egg left. Scrape the batter into the prepared pan and smooth the top. Set the roasting pan (with the springform pan still inside), in the oven and then pour the boiling water from the kettle into the roasting pan. Pour until the water reaches about halfway up the side of the pan. Bake the torte until the edges are just set, a thin crust is formed over the top, and an instant read thermometer reads 140 degrees, about 20 minutes. Don’t over bake. Let the torte cool in the roasting pan for 45 minutes. Remove the torte from the roasting pan and let it cook on a wire rack for 2 1/2 to 3 hours. Wrap the pan tightly with plastic wrap and refrigerate until set, about 12 hours. Before serving, run a knife along the edge of the pan and remove the sides of the pan. Slide the torte onto a serving platter or cake stand and dust with confectioners sugar if desired. Slice into thin pieces and serve with sweetened whipped cream. The texture of this torte is very, very light, almost like a mousse or cheesecake. It’s amazing, but different from what you are used to. The temperature of this torte is important to get that perfect texture. I recommend a thermometer. This would be great in individual ramekins, cooking them until the temperature reaches 140 degrees. Make sure you read all of the tips and tricks ahead of time, so you can get this cake right the first time (though no one was sad that I made it 6 times in my house…). Enjoy it from my kitchen to yours! 3 ingredients?? No way! And I have all of those at home too! I love how you had your mom try it too. My baking has been turning out so flat lately, and I don’t know why! I have had so many baking fails, that I have given up on cakes lately. But maybe I will try this! Mom’s are the best aren’t they. And she and my dad are the only ones at home so she had to share with a friend, and they LOVED it too, it’s actually pretty allergen friendly (depending on your needs) so she took it to a gluten free friend! I haven’t made this in a very long tike, and I misplaced the recipe and was so hapoy to have found it again!! I will be making 2 of these this weekend; one for home and one for work!! The last one I made, I used stencils and powdered sugar to add a holiday design on top!! Still waiting for the 12 hour set!! I wish recipes like this had an alert at the top for the wait time. I was making this for my son’s birthday and didn’t see this part until after the cake was in the oven.